Unsaturated compounds involving a silicon atom are intrinsically very unstable unlike their carbon analogs. Dr. Kira and his research group have synthesized trisilaallene and related heavy allenes as the first compound with a formal sp-hybridized silicon by taking advantage of steric protection due to bulky substituents originally developed by them. Those allenes have been found to feature unusual bent and fluxional skeletal structures, in contrast to carbon allenes with linear rigid CCC skeleton. The illustration in the cover shows the X-ray molecular structure of the trisilaallene with the central silicon atom (Si2) being disordered and observed in four subspaces divided by two roughly perpendicular five-membered ring planes. The occupancy factors of the Si2 atom at the four sites are not the same and remarkably temperature dependent, indicating facile rotation of the Si2 atom around the Si1—Si3 axis even at low temperatures in the solid state. The origin of the unique bonding characteristics of the trisilaallene is ascribed to the Jahn-Teller distortion associated with the effective π-σ* orbital mixing, suggesting wider applicability of the orbital mixing model than ever thought. 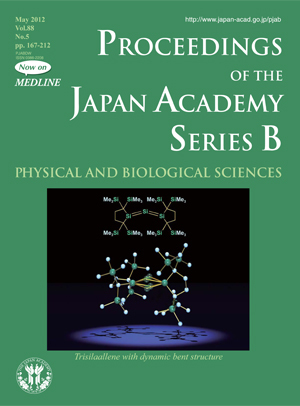 In addition to the trisilaallene, Dr. Kira’s group has also created a number of novel silicon unsaturated compounds such as various acyclic and cyclic disilenes, a spiropentasiladiene, and disilene-transition metal complexes and elucidated the unusual properties and their origin of these compounds, in comparison to those of the carbon congeners. The discoveries of his group have stimulated further development of synthetic research in the field and encouraged experimental and theoretical studies to understand the bonding and structural differences between unsaturated compounds of carbon and of heavier group-14 elements and to extend a new paradigm in the general theory of bonding and structure of heavy main group element compounds.